Posted: April 1st, 2012 under 6M, Hamradio. A few weeks back a card arrived in my mailbox. It was from Canada, and a long time has passed since I last mailed a card to Canada. 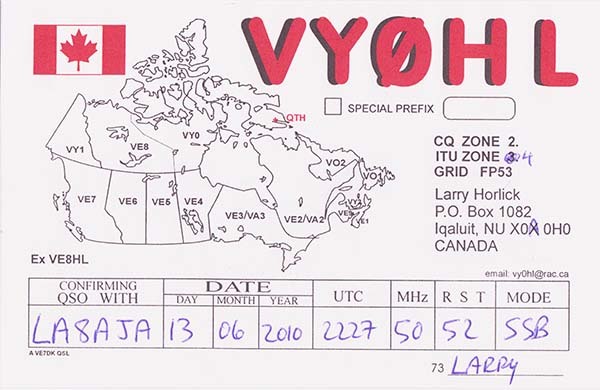 Turns out it was VY0HL confirming my only Zone 2 contact on 6M. The openings to that part of the world is very rare and even more rare is a station on at the right time. Thanks a lot Larry! Listen to Larry's signal and my post about the opening here.